The Weeknd and Futura 2000 have joined forces to proudly present a limited-edition XO artist capsule collection, celebrating The Weeknd's 2017 Starboy Legend of The Fall World Tour. The collection is presented in partnership with Bravado. The collection leverages Futura 2000's iconic handstyle and character drawings, rendering powerful gestures and plays on The Weeknd's iconography, XO brand logos, and Starboy album lyrics and color palate. Launching exclusively at Union Los Angeles on Friday April 28th, the sprawling capsule includes Alpha Industries MA-1 bomber jackets, Levi's denim jackets featuring embroidery, skate decks, caps, and an array of hoodies and tees. Los Angeles will feature several styles available in an LA-exclusive red color way, as well as the larger, multi-city, black color capsule. 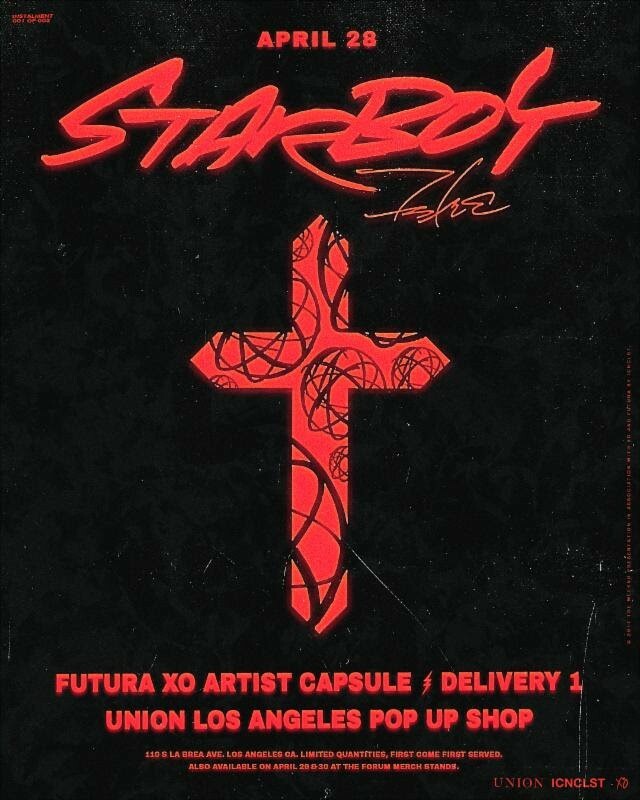 As is the case with later tour dates, the collection will also be available in LA at The Weeknd's stadium show (The Forum) this weekend (April 29th and 30th). After the LA tour dates, the capsule collection will also have pop-up retail releases, powered by Bravado, to correspond with The Weeknd's tour dates in Toronto (May 26th) and New York (June 6th and 7th). Futura, alongside his artist management and design agency ICNCLST, collaborated with The Weeknd and his XO creative brain trust to create this exciting artist capsule collection. From initial color stories and patterns, to graphical layouts and logo re-designs, the teams worked with one another to create a collection that would celebrate Futura's iconic art style and The Weeknd's powerful sonic and aesthetic identity. This project was a fully synergistic collaboration, with the unified team collaborating across all functions of creative inspiration, art direction, creative direction, and design. "I'm really excited about this collaboration. Futura's been a legend in art and fashion for so long. It's an honour to work on something like this with him." "I have a history of collaborating with musicians across four decades of my artistic career. It's one of the most-inspiring ways that I can express my artistry. I've collaborated with the likes of The Clash, Cabaret Voltaire, Unkle, NIGO (under his previous imprint APE SOUNDS), The Deftones, John Mayer, and now very proudly The Weeknd." "The vision was to always make XO a respected and recognizable brand across all platforms of art. Collaborating with Futura was a very honouring achievement. I'm very excited to share this with our generation." "Music and art are kinetic, non-linear forces. When combined, they have the power to captivate both sight and sound. As artist managers, we work to align my talent with brands, galleries, and collaborators that are both harmonious-but also potentially unexpected. Futura and our team have long considered The Weeknd as being an amazing potential collaborator; his sound and art direction has always been charged, dynamic, irreverent, and entirely unique. The Weeknd, and his team's creativity, has always captivated us. It's amazing that this project has come together so organically with Abel, La Mar, Sal, Drop and the whole XO family." A pioneer when graffiti met contemporary art, Futura (American, b. 1955), alias of Leonard McGurr was known as early as the seventies for his radical approach in the street, introducing abstraction to an entirely letter-based discipline. His work caught the attention in the 1980s, and Futura (then Futura 2000) found himself part of a wider art movement that included the likes of Jean-Michel Basquiat, Keith Haring and Julian Schnabel. Entirely self-taught in what he calls "the subway school", Futura has been compared to Kandinsky and Klee for his mastery of color, movement and line; and friends Basquiat, Kenny Scharf and Rammellzee for his progressiveness and of-the-moment relevance. Radical then, his methodology can now be viewed over a span of decades as something consummately pure. When compared to the many street artists who have come along since, Futura's work still stands apart for its subtlety, use of white space, and elemental quality. The artist knows all that is needed - as it was at the beginning - are clouds of primary color, arresting movement, and skillful tricks with a spray can. Insight and proficiency have kept him relevant for 40+ years with no signs of slowing down, and successors have yet to match Futura's impossibly thin aerosol lines. Futura can followed on instagram at @futuradosmil, and contacted through his artist management agency: ICNCLST Art and Artist Management (www.icnclst.com). Starting off his career anonymously, The Weeknd first broke into the music scene with the 2011 mixtape House of Balloons followed by studio album Kiss Land in 2013 and the widely recognized Beauty Behind the Madness that earned him two Grammy Awards in 2015, an RIAA triple-platinum certification for cumulative sales in excess of 3 million, 16 RIAA certifications from tracks alone with "The Hills" [7x-platinum], "Can't Feel My Face" [5x-platinum], "Often" [2x-platinum], "In The Night" [platinum], and "Acquainted" [platinum]. "Earned It (Fifty Shades of Grey)" even garnered The Weeknd his first ever Academy Award® nomination in the category of "Best Original Song." Late last year, The Weeknd released his fourth full-length album "Starboy" which quickly rose to #1 in 90 countries, sold over one million albums globally and broke the global streaming record all in less than one week.